A few people have asked me what colors I use on my palette, and rather than listing them I thought it would be more fun to show them! This is the palette I had set up at the show (Celebration of Fine Art), where I was working on a few paintings at a time. I thought this would be a good one to show you since it has all of my favorite, “workhorse” colors out on it. Usually when I’m working on a project I’ll only have out the colors that I’m currently using, so this is a nice peek at my ten favorite pigments. Whatever colors I’m using, I always mix a few values for each color – a midtone and/or a light value, depending on the inherent value of each color in the tube. This way, as I paint I know that I can quickly grab the right value range for the mix I need at the moment. It’s also a great way to keep my lighter tones luminous, since I’m using colors to lighten a mixture rather than pure white. 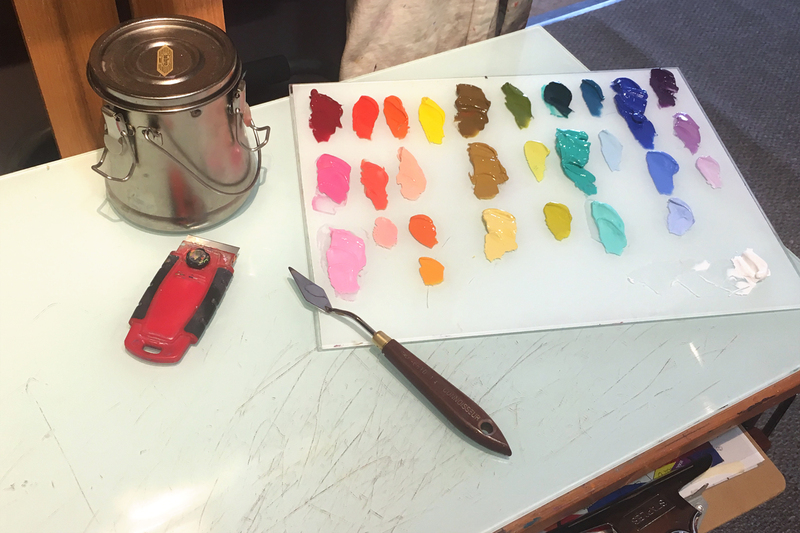 I keep my paints on a smaller (11″ x 14″) glass palette and put that on top of a larger (16″ x 30″) glass palette for my actual painting and mixing. When I’m not working, I put the smaller palette inside of a Sta-Wet Palette with a small rag soaked in clove oil, which keeps the paint fresh and ready to go – and means I can put out great big globs of paint at a time without guilt or fear! With my painting style, I prefer soft, buttery-textured paint with intense pigments. My favorite brand of paint is Classic Oils by Triangle Coatings (tricoatstore.com), and I also like Gamblin and Winsor Newton for a few extra colors. I will usually use only 5 – 7 of these on a given painting, though I’ve used as few as 3 or 4. Unless I really want to juggle fireballs while riding a unicycle on a tightrope, I don’t use more than 7 colors at a time – in my experience, once I get over 6, any color I add could be mixed by any of the previous colors (or replace them). *Because of tradition and science and possibly phases of the moon, not everyone calls the same pigment mixture by the same name. Any time I list two names for one color it’s simply the same pigment from different brands. Quinacridone Red (Classic Oils)/Permanent Rose (Winsor Newton) – Transparent: I’ve replaced Alizarin Crimson with this. It’s a little rosy, but it makes great oranges and violets and I find it mixes really beautifully into pretty much any color, especially greens. I’ll use this one in almost every painting (unless I’m doing a palette where I’m eliminating reds, like the crazy person I occasionally am). Cadmium Red Light (Classic Oils) – Opaque: This is one of the last holdovers from my original five-color palette. I still love this color, but I often replace it with Winsor Orange unless I need the opacity or the pure saturated red-ness. Winsor Orange (Winsor Newton) – Semi-Transparent: I rarely use this and Cadmium Red Light in the same painting, but I rely on Winsor Orange more heavily. I love how nicely this mixes into greens and violets, giving me the tawny and chestnut tones I use so much for horses and wildlife. Mixed Orange (Personal Mix) – Opaque: If I’m using Cadmium Yellow Medium, I’ll usually mix a little orange (using whatever red will be dominating my mixtures) to save time mixing it along the way. This particular one is mixed with Quinacridone Red. 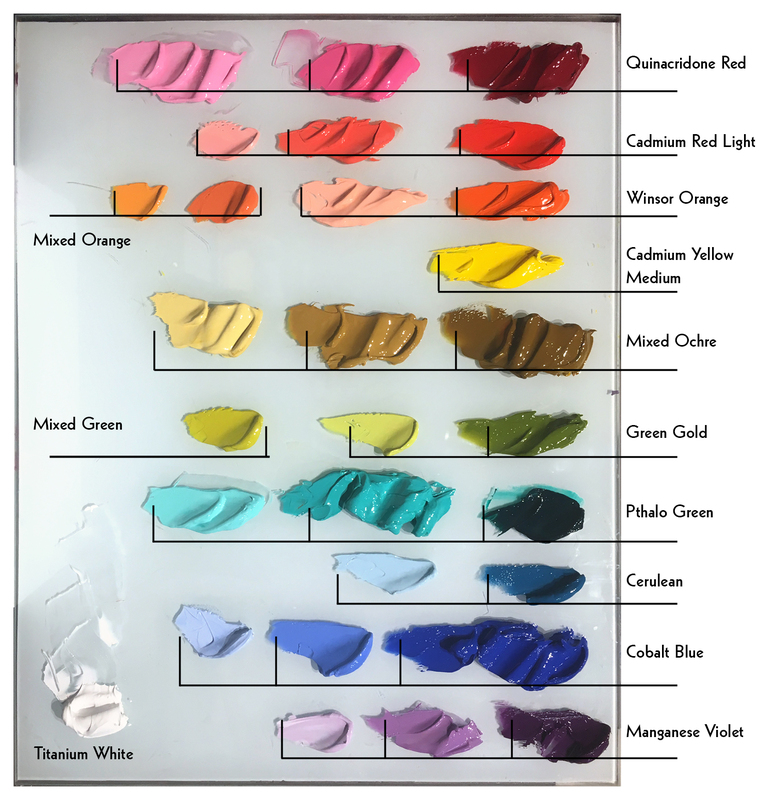 Cadmium Yellow Medium (Classic Oils) – Opaque: The final holdout from my original palette. I very sparingly use this one, actually, unless I’m painting a bird or flower with yellow local color. I prefer this yellow to Cadmium Yellow Light or Lemon because it tends toward a redder shade, making naturally-less-intense greens. Mixed Green (Personal Mix) – Opaque: Similar to the orange, if I’m using Cadmium Yellow Medium on my palette I’ll make a green mixture using whichever blue I’ve chosen for my palette (this one is mixed with Cobalt Blue). Green Gold (Classic Oils) – Semi-Transparent: This is my faaaaavorite color, it goes into just about every mix I make. I almost always have it on my palette, unless I’m going for a super-limited palette. However, if I’m doing any vegetation I’ll still mix my own green – mixed greens are always more natural and easy to control than green out of a tube. Pthalo Green (Classic Oils) – Transparent: This has replaced Viridian on my palette. Despite the name, I group this in with my blues. Thalo gives me beautiful turquoises and teals, and surprisingly beautiful violets. As a blue-green, Pthalo Green and Cerulean are somewhat interchangeable, so I rarely use them in the same painting. Cerulean Blue (Classic Oils) – Opaque: My newest addition to my palette! I use it for the same things as Thalo Green, but Cerulean is more opaque, less bossy, and has a lighter inherent value, so it really depends on the needs of each painting. This has a distinct greenish tone, so it makes very interesting brown-violets and grey-oranges. Cobalt Blue (Classic Oils) – Opaque: A few years ago I swapped out Ultramarine for Cobalt – it’s more expensive, but I love it. As a mixer it’s on the subtle side, making natural-looking greens and gorgeous violets. With Winsor Orange I can get this really nice rosy-chestnut. 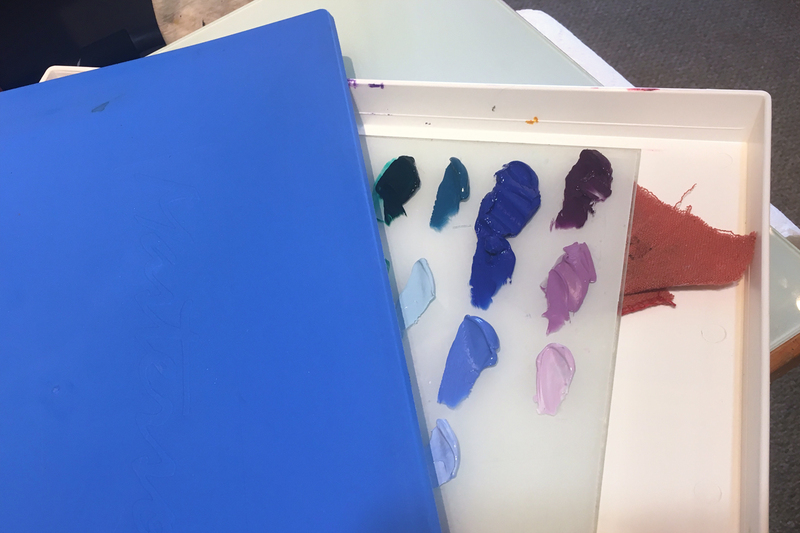 If I need a darker blue I can easily get one by mixing Thalo Green with Quinacridone Red or Manganese Violet, but honestly I rarely need anything as dark as Ultramarine. Manganese Violet (Gamblin) – Semi-Transparent: If I need to simplify my palette I’ll make my own violets, but as far as pre-mixed violets go this is my favorite. It’s not as bossy as Dioxazine – which tends toward an unreal blue-tone anyway – and makes beautiful sorrels when mixed with Cadmium Red Light or Winsor Orange.